1. RESERVE 1 Tbsp. chopped candy. Mix remaining candy with cream cheese and cookie crumbs until blended. 3. 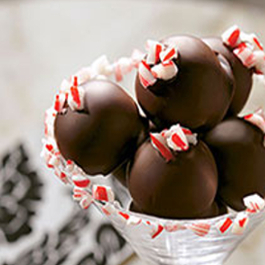 DIP cookie balls in melted chocolate; place on waxed paper-covered rimmed baking sheet. Sprinkle with reserved candy.